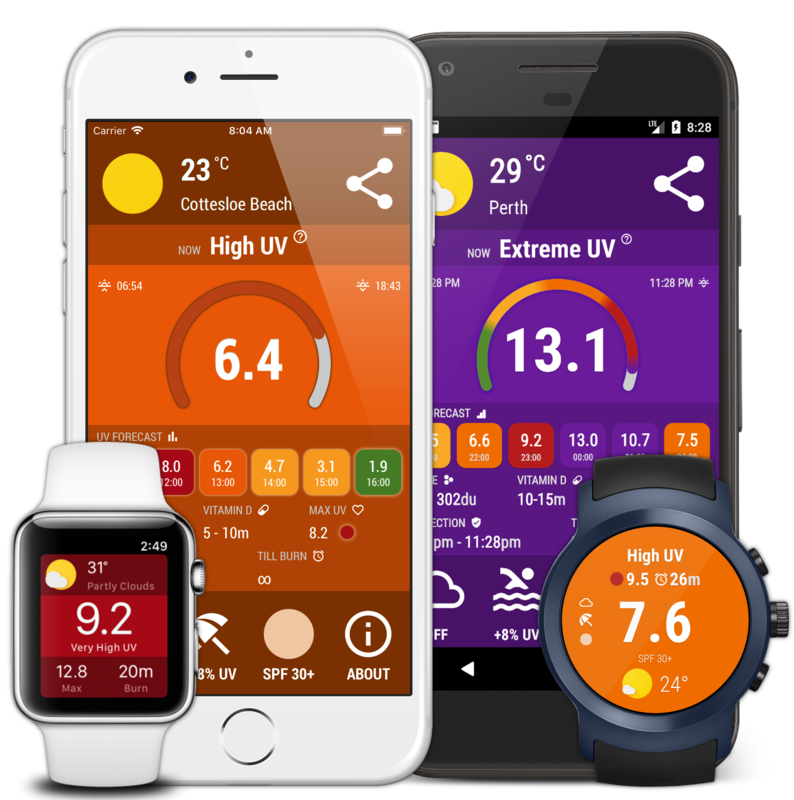 Meet UVIMate, your personal Sun Safety Coach designed for your Skin Health & Sun Awareness. Mobile, wearable, global. By downloading or using the app, these terms will automatically apply to you – you should make sure therefore that you read them carefully before using the app. You’re not allowed to copy, or modify the app, any part of the app, or our trademarks in any way. You’re not allowed to attempt to extract the source code of the app, and you also shouldn’t try to translate the app into other languages, or make derivative versions. The app itself, and all the trade marks, copyright, database rights and other intellectual property rights related to it, still belong to Alexander Ershov. Alexander Ershov is committed to ensuring that the app is as useful and efficient as possible. For that reason, we reserve the right to make changes to the app or to charge for its services, at any time and for any reason. We will never charge you for the app or its services without making it very clear to you exactly what you’re paying for. By accessing, receiving, downloading, syncing, using, or possessing OR continuing to access, receive, download, sync, use or possess software, toolbars, user interfaces, applications and associated media ("Software") for use on mobile devices, via the internet, submitting a profile information, or clicking the "I Agree" or "Continue" buttons when prompted and completing the profile information, Subscriber (referenced also as "you") is entering into this Agreement with UVI Mate, and Subscriber hereby acknowledges and agrees to the validity and applicability of the Terms and Conditions governing this Application, the Privacy Statement, any applicable Subscription Terms and Provider Terms, and agrees to be bound hereto. The Products are available only to individuals that have the capacity to create a binding legal obligation regarding your use of the Application and by accessing this Application, all users represent that this requirement is met. The UV Index Now - UVI Mate app stores and processes personal data that you have provided to us, in order to provide my Service. It’s your responsibility to keep your phone and access to the app secure. We therefore recommend that you do not jailbreak or root your phone, which is the process of removing software restrictions and limitations imposed by the official operating system of your device. It could make your phone vulnerable to malware/viruses/malicious programs, compromise your phone’s security features and it could mean that the UV Index Now - UVI Mate app won’t work properly or at all. You should be aware that there are certain things that Alexander Ershov will not take responsibility for. Certain functions of the app will require the app to have an active internet connection. The connection can be Wi-Fi, or provided by your mobile network provider, but Alexander Ershov cannot take responsibility for the app not working at full functionality if you don’t have access to Wi-Fi, and you don’t have any of your data allowance left. With respect to Alexander Ershov’s responsibility for your use of the app, when you’re using the app, it’s important to bear in mind that although we endeavour to ensure that it is updated and correct at all times, we do rely on third parties to provide information to us so that we can make it available to you. Alexander Ershov accepts no liability for any loss, direct or indirect, you experience as a result of relying wholly on this functionality of the app. At some point, we may wish to update the app. The app is currently available on Android and iOS – the requirements for both systems (and for any additional systems we decide to extend the availability of the app to) may change, and you’ll need to download the updates if you want to keep using the app. Alexander Ershov does not promise that it will always update the app so that it is relevant to you and/or works with the iOS/Android version that you have installed on your device. However, you promise to always accept updates to the application when offered to you, We may also wish to stop providing the app, and may terminate use of it at any time without giving notice of termination to you. Unless we tell you otherwise, upon any termination, (a) the rights and licenses granted to you in these terms will end; (b) you must stop using the app, and (if needed) delete it from your device. Please be advised that some, but not all, areas of the Application may contain fee-based services, and are subject to additional Buying in-app purchases(IAP) in our iOS app. Service makes no express or implied warranties, guarantees or affirmations that the ultraviolet data and or weather information will occur or has occurred as the reports, forecasts, graphics, data, briefings or information comprising the Application, products or services state, represent or depict and Service shall have no responsibility or liability whatsoever to Subscriber or any other person or entity, parties and nonparties alike, for any inconsistency, inaccuracy or omission for weather or events predicted or depicted, reported, occurring or occurred. There may be times when data or services from third parties that Service normally uses as all or a part of the basis of its information and services is unavailable or disregarded and Service shall have the right to continue to issue such products, information and services without informing the end user of the changed basis or source of such products, information, or services and to change sources from time to time. Web-based and Mobile/wireless services are dependent upon open communications networks provided by third parties, and UVI Mate is not responsible for lack of services due to communications network outages. SUBSCRIBER IS ADVISED AND INFORMED THAT THE GOVERNMENT ISSUES OFFICIAL WATCHES, WARNINGS, AND ADVISORIES, BULLETINS AND OTHER COMMUNICATIONS. SUBSCRIBER SHOULD KEEP ADVISED OF SAME. SUBSCRIBER AND THIRD PARTIES ARE SOLELY RESPONSIBLE FOR ACTION OR LACK OF ACTION TAKEN TO PRESERVE HEALTH, LIFE OR PROPERTY. Service makes no warranty or representation with respect to any Provider products or materials. Subscriber is advised and informed that content provided or accessed through the Application in association with wireless weather information services is not provided by, the responsibility of, nor within the control of, any mobile/wireless communications carriers, internet service providers, or internet storefronts. If you have any questions or suggestions about my Terms and Conditions, do not hesitate to contact me on uvimateapp 'at' gmail.com. Copyright 2016-2018 UVIMate. All Rights Reserved.